During the restoration, architectural details such as the building's exterior bronze and stone work, the iconography of the Great Hall, and original paintings commissioned for the NAS were repaired and cleaned to revive the original beauty of this landmark structure. After more than eighty years of exposure to the elements the exterior bronze windows, designed by Lee Lawrie, required substantial cleaning and repatination. The goal of the cleaning was to remove surface soiling and corrosion, in order to prepare the metal for repatination. To that end, all surfaces of the exterior bronze windows, including the spandrel panels and mullions, were cleaned with a gentle detergent, scrubbed with natural bristle brushes, and thoroughly washed with pressurized water. Based on historic photos, records, and on-site analysis, conservators and architects determined that the original decorative scheme used two contrasting colors, light blue-green “verdigris” and dark statuary bronze, so that the sculptural elements raised in bas relief would contrast with the background. Because some of these original colors still remained on the metal, the conservators were able to work with the existing patina, augmenting and adding to it as needed. Bronze window panel undergoing cleaning, Constitution Avenue façade. © 2010 Conservation Solutions, Inc. Cultural Programs of the NAS. 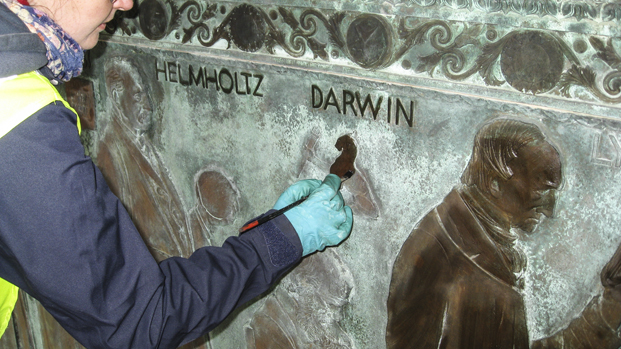 During the building restoration, great care was taken by expert conservators to clean the iconography and decorative details created by artist Hildreth Meière for the Great Hall. The approach to cleaning and conservation was straightforward but required meticulous, time-consuming labor. Methods were chosen carefully to minimize the risk of damage to the art. 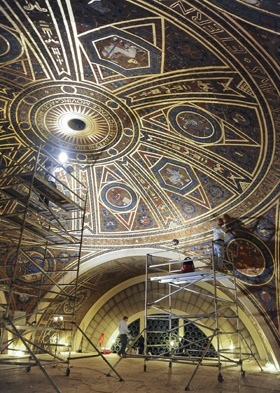 The Guastavino tile with raised decorated ornamentation was first vacuumed to remove any loose dust or grime. Then it was dry cleaned by hand with vulcanized rubber sponges. The gilded areas were gently washed in a three-step process: first, a solution of six parts distilled water to one part Vulpex conservation soap was applied using sterile cotton; in the second step, the area was rinsed with sterile cotton saturated with distilled water; and in the third step, each area was dried with sterile cotton. Painted surfaces and the tile itself were cleaned in a dry method, using vacuum cleaners and dry cleaning erasers only. Both of Albert Herter's paintings for the Academy building – his Prometheus mural in the Great Hall and his portrait of Lincoln and the Academy founders in the Board Room – required thorough cleaning. 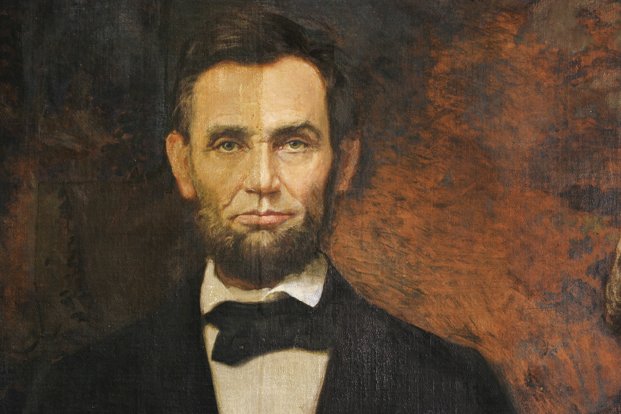 To protect the paintings from dust and debris raised by restoration activity, the team of conservators removed the Prometheus and Lincoln murals. Removal required de-installation of Prometheus — nearly 400 pounds of fragile paint on canvas installed more than twenty feet above the floor of the Great Hall — and careful dismantling and removal of the plaster-bound Lincoln mural. The conservators worked to stabilize the canvases and layers of paint and to clean the surfaces, removing the heavy layers of previous restoration that not only visibly obscured the images, but also had altered much of the original design. After restoration, the murals were reinstalled in their original locations. left to the cleaned area on the right. Photo: Olin Conservation.